Artillery weapons always add a Suppression token even if they don’t get a hit. Laser weapons roll an additional die for every hit they get until the player no longer rolls hit symbols adding all the damage together. Additionally, for Laser weapons that roll one dice to hit and cause multiple points of damage this is inverted (so a Hermann rolls 3 dice each causing a single point of damage when attacking Vehicles). Most infantry Laser weapons also had their range increased by an additional 4″. Panzerfausts have the Grenade special ability. 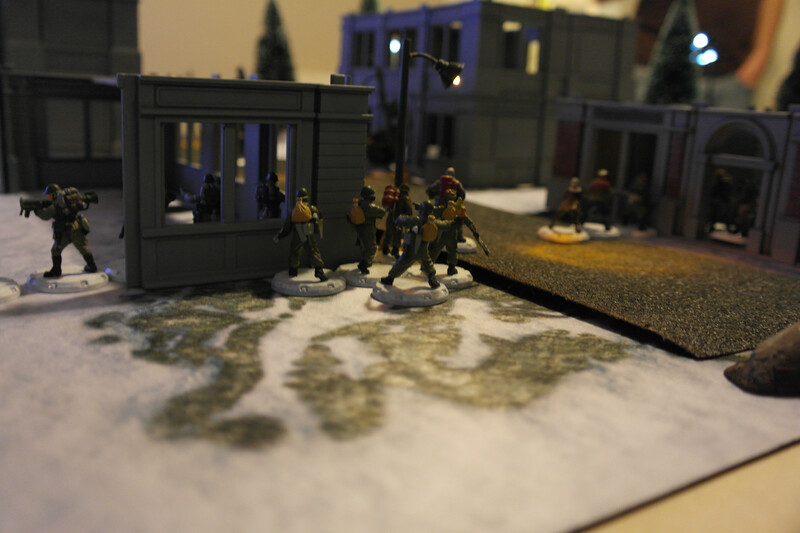 We went with the Custom Scenario in the Dust Warfare Core Rulebook: Secret Mission. We had discussed this at the end of our last game of Dust Warfare so each of us could have an opportunity to tailor our army list toward it. As you will see, my opponent did an excellent job of playing toward the objectives by the way he built his army. For this scenario, the Secret Mission Objective I chose was number 3: Capture Strategic Points, where 50 Superiority Points (SPs) were given for controlling the center of the table. My opponent sneakly picked Secret Mission Objective 2: Intel Gathering, gaining 25 Sps for every enemy unit within 18″ of a Radioman. The site of battle is once again on the eastern front between the Axis Forces and the SSU. 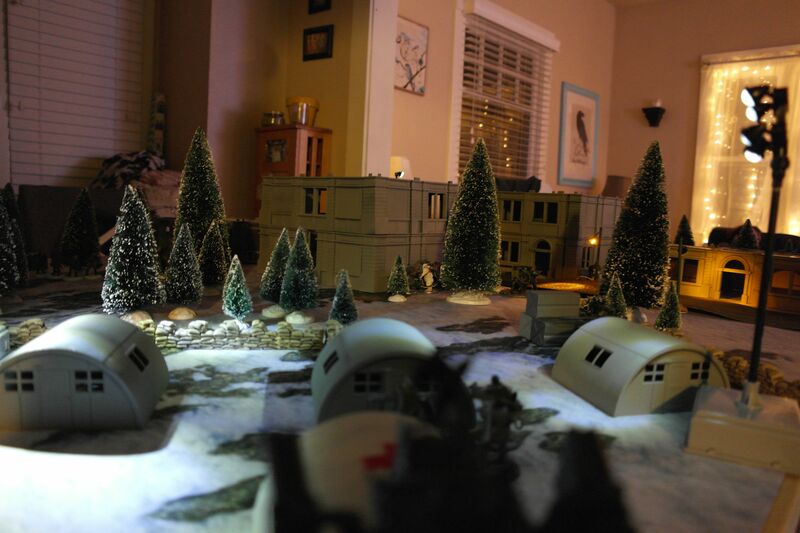 Their previous engage left each force in a stalemate, the SSU seeks to rally their troops by capturing and holding a small city in the heavily pine forested region. The Soviet leadership believe if they can hold a statue of Vladimir Lenin in the center of the city from the Axis forces it will increase the morale of their troops. Meanwhile, the Axis seek to gather intelligence of the strength of the Soviet presence in the region to better decide their next course of action. 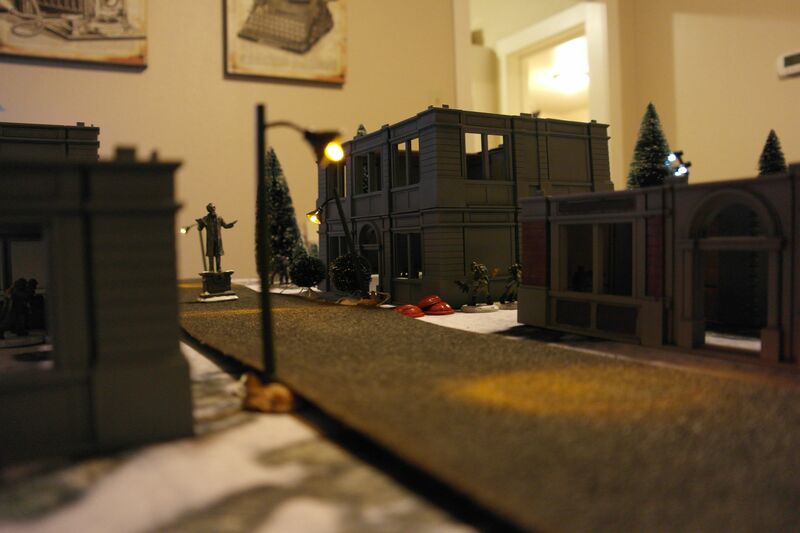 For this game the table was split down the middle by a road with buildings lining it on either side. At the center of the table is a statue (I think it rather does look like it could be a Soviet Leader). On either side of the buildings are pine forests that were spaced in such a way as to allow vehicles to travel through them (we consider them basically logging roads). It a player didn’t want to bother with that, we added a rule that a vehicle could move through all but two largest sized trees removing the tree from the table. However, to do so required a roll of a die and on a hit the roots of the tree would hold ending the vehicle’s actions right there. Finally, in the corners are small military encampments composed of Quonset huts, crates, and tall tower lights all surrounded by sand bags. We treat sand bags as providing hard cover to infantry but no cover to vehicles and open terrain to soldiers but difficult terrain for vehicles. All deployment descriptions reference this photo. I deployed units mostly in clumps. In the picture above you can a member of the Red Command in the upper left. Also in that corner of the table is my Matrioshka which I placed as a counter to the Lothar (not pictured above but it would be in the lower left corner of the table if it were in frame) as well as my Natasha next to the single story building that is painted (upper middle-left of above picture). Half inside the painted building I place the Red Storm joined by Red Yana and Trediakovsky. To gain a bit a deployment intel I also placed Karamzin as a solo within that building. This is from my side The road bisects the table in half. The Fakyeli were placed in the single floor building with no wall on the rear side located on the other side of street (obscured but upper right) as well as the Red Thunder close to them. Finally, I placed Nastasia within the encampment. I instantly regretted placing the Nastasia there instead of the Natasha as I though it had more range which it doesn’t. 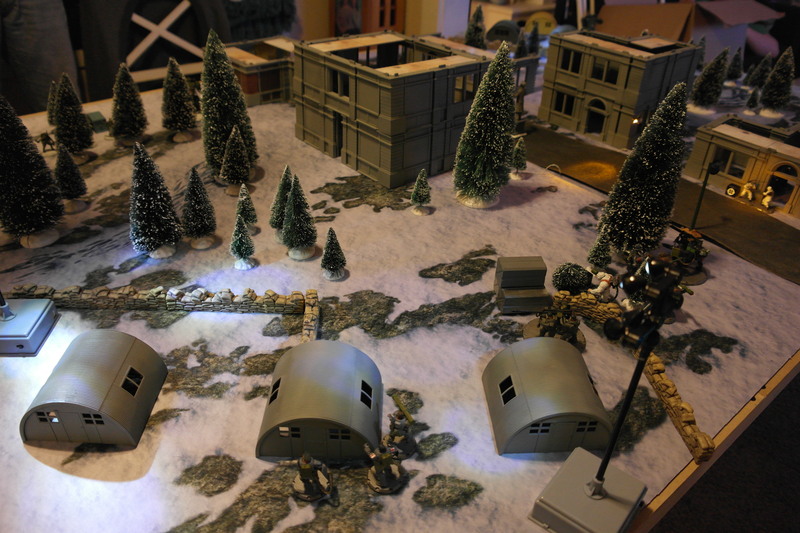 The Axis deployment going left to right in the above picture to this section was the Lothar placed in the absolute corner of the table behind the medical Quonset hut. Pictured in the lower middle is the Heavy Kommandotrupp and in the right of frame are the Jagdgrenadiere. Near the street but still on the side with the Axis encampment are Markus and Sturmaffe and the Laser-Jagdgrenadiere. On the other side (right side in photo) are the Laser Grenadiers, Beobachter Team, and Battle Grenadiers. 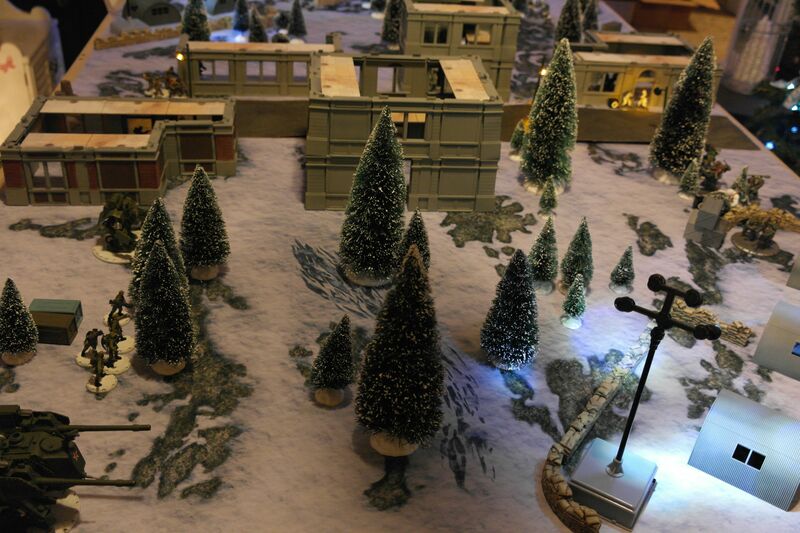 Over in the extreme right corner of the table were the Kommandotrupp and the Sniper Grenadiers joined by Angela. Round one started with the Axis being the initiating player while the SSU were the responding player. The Axis issued an order to Angela and the Sniper Grenadiers to open fire on the Nastasia where she managed to tag it of a single wound and blind it. The SSU Command Phase involved me unsuccessfully trying to move the Nastasia to prevent Angela from getting a second shot and giving my Matrioshka an attack order on the Lothar not causing any damage but blinding it. The Axis Unit Phase involved them mostly advancing as the Battle Grenadiers, Laser Grenadiers, Markus and Sturmaffe, and Laser Grenadiers March Moved forward flanking both side of the city. The Beobachter Team managed to reach the smaller two story building toward the center of the city. Angela tried another shot on the Nastasia without success. The Heavy Kommandotrupp moved their mechanic within range of the Lothar and preformed a Mechanic action removing the Blind penalty. The Lothar fired at Red Yana and the Red Thunder causing three wounds after cover and armor which was all absorbed by Red Yana. Finally, the Jagdgrenadiere fired and failed to cause any damage to the Natasha. For the SSU Unit Phase I fired again with the Matrioshka unable to even bypass the cover protecting the Lothar with 9 dice. I advanced my Natasha and fired at the Jagdgrenadiere using the All In One special ability only getting a wound. I probably should have waited for a better opportunity to use All In One, but with Markus and the Strumaffe so close, I wasn’t sure how many chances I would get. I Marched Moved all of my troops further into the center of the city with the Red Thunder sw eeping around the backside of the buildings to prevent flanking of the Axis and potentially providing support to the lone Nastasia which moved again to only needing another Move to be in range of Angela. This round I seized initiative as I had 8 units to the Axis’ 10. I don’t believe I used any of my orders. I also don’t believe the Axis used any of their order either. If they did they didn’t have any effect. 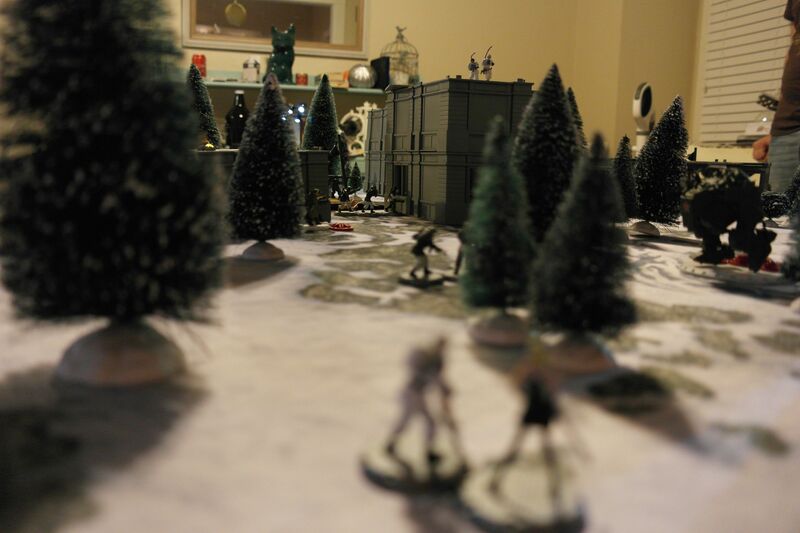 SSU Unit Phase, I fired with the Matrioshka at the Lothar once again, but this time as a Sustained Attack. However, I still could get enough damage to bypass cover and armor but I did manage to set the Axis walker on fire. 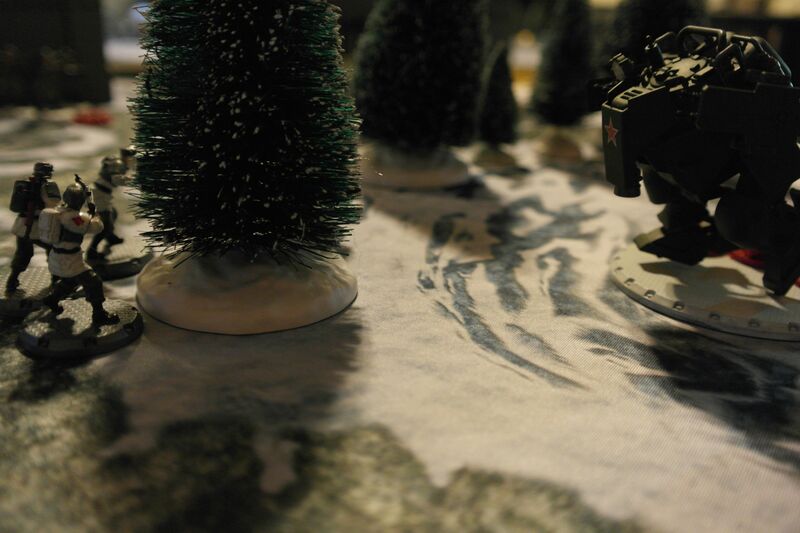 I decided that the Gorillas were just too close to my Natasha so I March Moved her toward the short edge of that side of the table where the Red Command could offer support if needed. 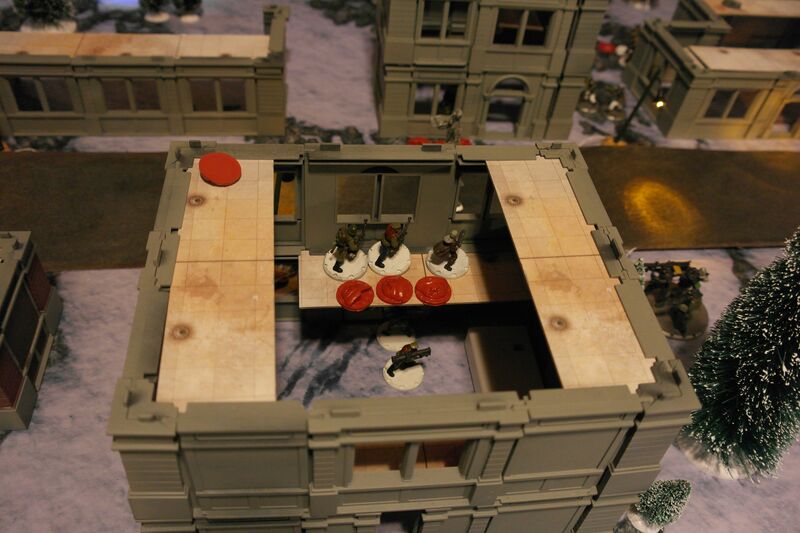 Red Yana and the Red Storm repositioned themselves in the large two story building with Yana and the machine Gunners taking positions on the second floor over looking the street by the rest of the squad covered the exits on the first floor. Red Yana and the DPM machine gunners had a clear shot to the Laser Grenadiers killing one or two of them. 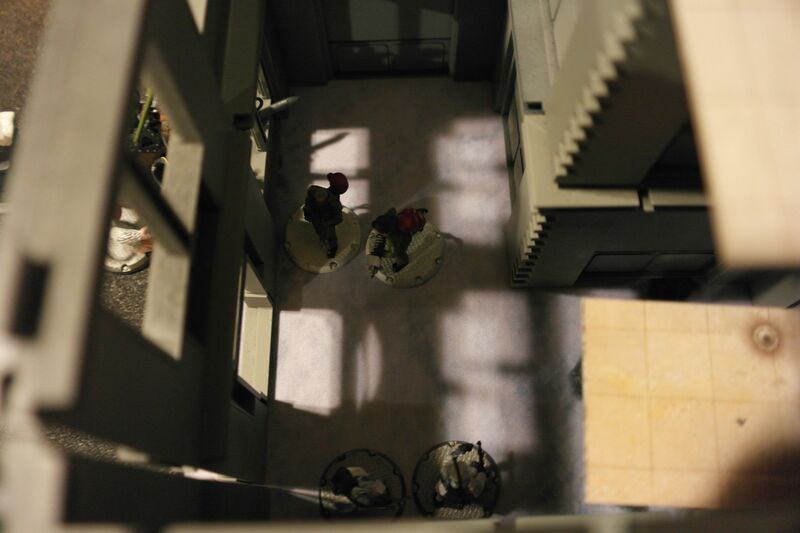 Yakov and the Fakyeli assaulted the smaller two story building able to draw reactions from either the Beobachter Team that shared the building with them or the Laser Grenadiers positioned outside. The Red Thunder moved into the backside alcove of the small two story building to prevent the Battle Grenadiers from flanking around. Finally, the Nastasia moved and fired on Kommandotrupp causing removing two of them from combat. Axis Unit Phase, The Lothar fired on Yakov and the Fakyeli completely stripping off all of Yakov’s spare Damage Capacity but not actually killing a single member so Grizzled Veterans held off suppression. The the Laser-Jagdgrenadiere had a go at them with no effect followed by the Laser Grenadiers which caused Yakov and team to react wiping them out before a single laser could fire. 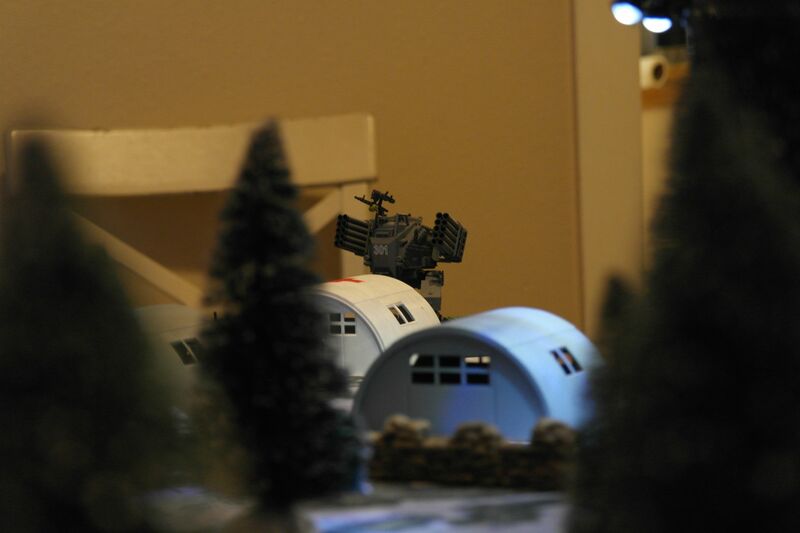 Without a reaction, the Battle Grenadiers took up position where the Laser Grenadiers had stood and they attacked Yakov’s squad killing two and finally placing some suppression on them. The caused my Red Thunder to make a Move reaction to advance around the building to setup an attack next round. Markus and the Sturmaffe charged Yakov and the Fakyeli but not before Red Yana made a move reaction to setup to attack the gorillas en force next round. The apes managed another two kills. However, the Axis weren’t done with the old Russian solider. The Beobachter Team fired their assault rifles into Yakov but even with a sustained attack and no cover couldn’t harm them. They Heavy Kommandotrupp set themselves up so the mechanic could fix the Lothar ridding it of being on fire (before it shot) and the Medic could heal the Jagdgrenadiere. This was the round I actually wanted to go second this turn provided I rolled plenty of order dice as I had numerous units poised to make attacks in and around the city. Initially, I rolled 3 order but was matched by the Axis causing a re-roll where I had two and he got four. I decided on Yakov and the Sulfur Thrower Fakyeli to try and weaken Markus and the Sturmaffe which had some success causing a single point of damage. However, it was my second order given to Red Yana and the Red Storm which erupted in a hail of gun fire, grenades, UGLs, and Molotov cocktails that destroyed those damn, dirty apes. The Axis Command Phase had the Laser-Jagdgrenieders fire on the now exposed Red Thunder but couldn’t beat the cover they still had. The Kommandotrupp made a Move action toward the Red Thunder sneaking up behind them. However, they aren’t close enough to get but a couple solders within range to fire. 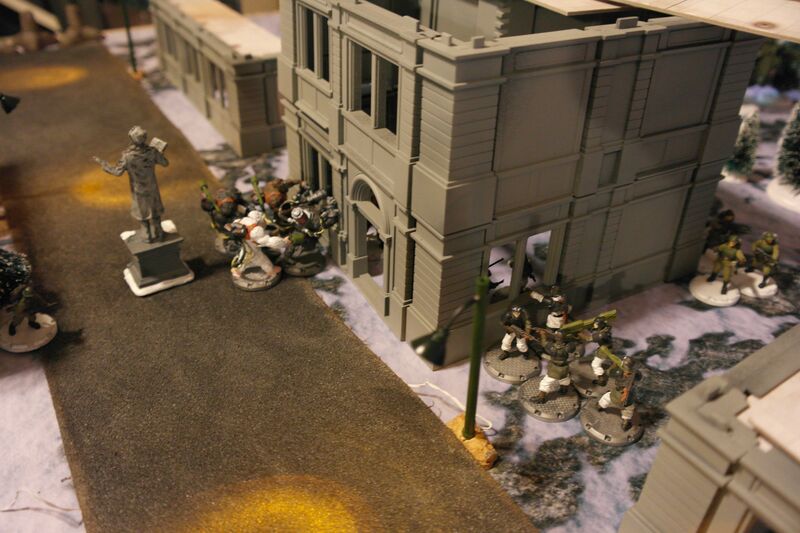 SSU Unit Phase, the battle for the center of the city was far from over as I attacked with with Red Yana to at least suppress the Battle Grenadiers. I won initiative again with only a single order which I used to attack Angela and the sniper team removing the other sniper. My opponent didn’t use any of his orders I think. 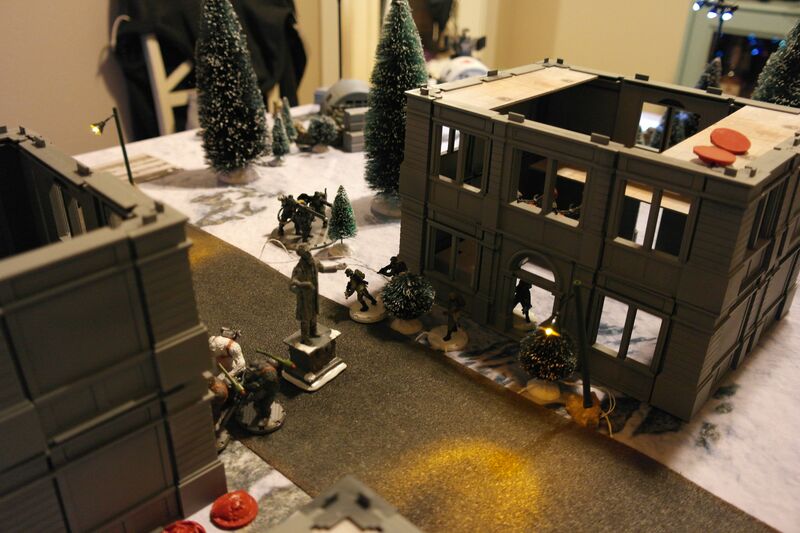 The Unit Phase for the SSU involved finishing off the Battle Grenadiers as well as Angela and the Sniper Grenadiers. My Matrioshka still couldn’t cause direct damage to the Lothar though did manage to catch it on fire which did cause a point of damage as the Axis Player didn’t bother putting it out and the Heavy Kommandotrupp moved too far away. The Unit Phase for the Axis a wasted attack on the Red Storm by the Laser-Jagdgrenadiere and a similarly weak attack on the Red Thunder by the Kommandotrupp. 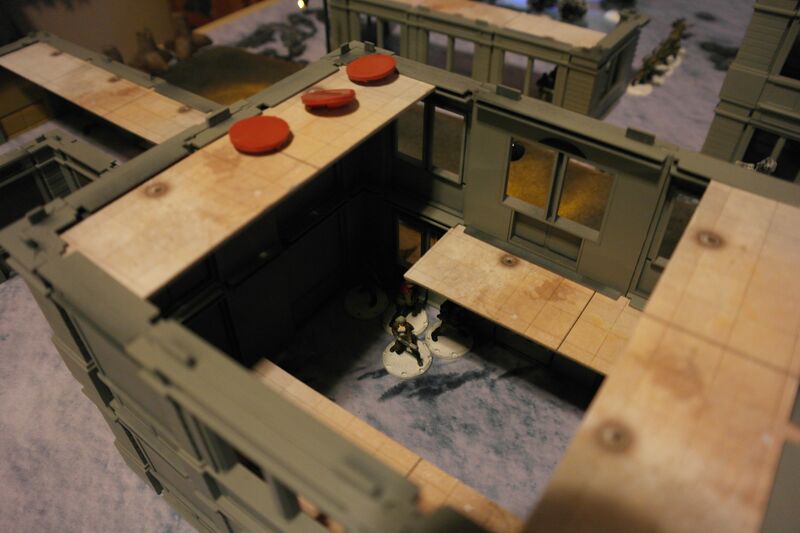 Even the Lothar wasn’t able to cause anymore damage to Red Yana’s squad despite rolling 14 dice. The Axis also oddly had his Beobachter Team March Move on top of the building. All the while the Heavy Kommandotrupp March Moved out of the encampment for the first time. The Command Phase was rather unremarkable as both sides didn’t accomplish anything much. It wasn’t until the last turn that the Matrioshka finally finished off the Lothar but even then just barely. The Natasha finally managed a decent shot on the Heavy Kommandotrupp but only managed to give them a suppression. Red Yana activated Fighting Spirit but I was concerned that the Laser-Jagdgrenadiers would react so I held back enough troops to keep my hard cover. I just wasn’t able to get past the Schwer armor of the Axis troops to do anything. I tried shooting at the Kommandotrupp with the Nastasia but only removed another troop. My remaining Red Thunder went into hiding as to not lose those points, or so I thought. 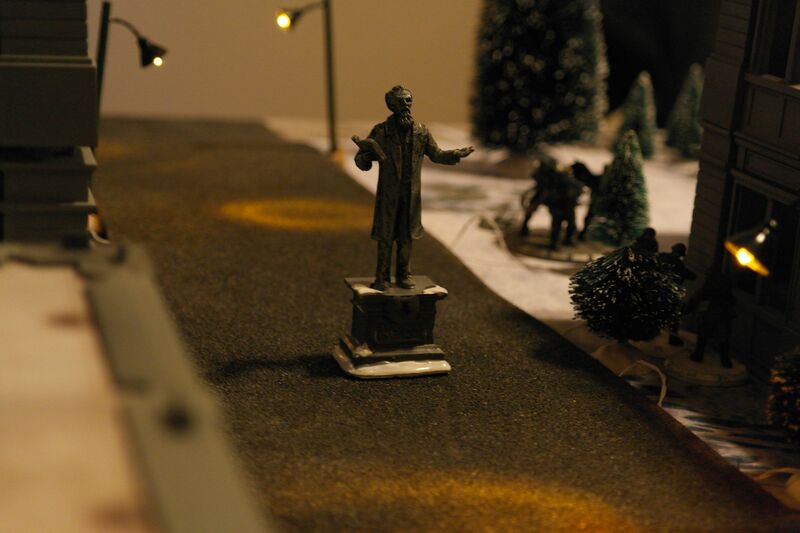 The Axis turn consisted of moving his units with the Radioman special ability making sure he could get as many of them within 18″ of all of my units. If it wasn’t for the bit of suppression that my Natasha placed on the Heavy Kommandotrupp he would have been able to March Move them and get all of my 8 units. He was just shy of the Matrioshka. 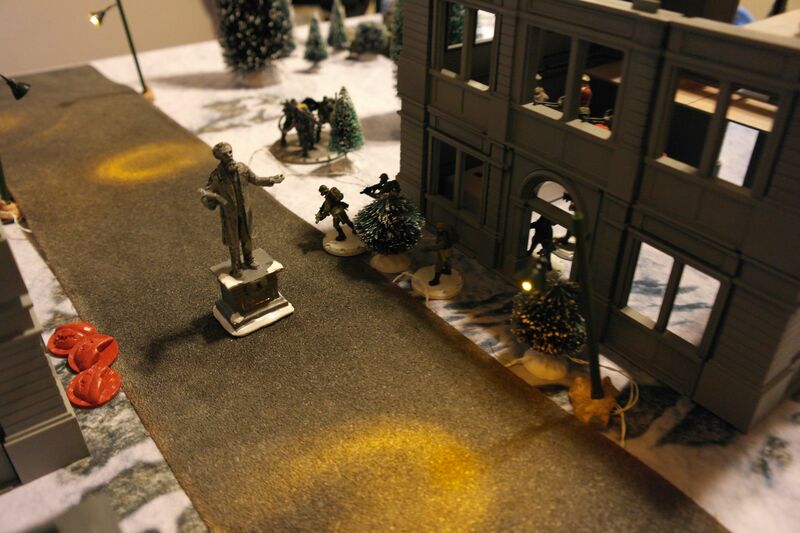 The last thing he did was Move his Laser-Jagdgrenadiere within 6″ of the statue. I attempted to make him pay for that but could muster up enough firepower completely destroy the Soldier 3 support weapon team. He also couldn’t kill off any of my squads in this final desperate push. As mentioned at the beginning of this article, this was the best game of Dust I had ever played. By turn 4 I was pretty sure I wouldn’t be able to capture the center of the table as the Axis player just have too many units, many of the Solider 3, that I just didn’t have the firepower to take out all of them. I figured that my opponent had taken the same secret objective and that was why we were fighting so hard in the center of the city. I believed that the Radioman objective only worked for vehicles. My jaw dropped with my opponent corrected me that it was any enemy unit with in 18″ and that he actually wasn’t trying to kill off anyone them. He played me from the beginning. He knew that I would ignore his Radioman squad in favor of bigger targets. And he was completely right. I only won because he couldn’t March Move the Heavy Kommandotrupp close enough to also get the Matrioshka within 18″. In fact, I gave him 25 free Superiority Points when I decided to run the Karamzin solo so I could see a little more of how he was deploying since I didn’t see then need for two fully functional anti-armor units when he only had the one. It is games like that where both players are locked tightly in battle struggling against each other to meet their aims and it is so very close coming realistically only a single action being the difference between victory and defeat. Axis: The Axis named all of his units with the Radioman special ability as his MVPs. However, I believe that the Beobachter team truly deserves it the most. They were the team that the Lothar used the most, and they were the unit that spend two full rounds in the same building as Yakov and the Fakyeli without taking a scratch. SSU: While my opponent disagreed somewhat, I felt that Yakov and the Fakyeli were my MVPs. The Axis player it should have gone to Red Yana, Trediakovsky, and the Red Storm because they killed far more than Yakov’s squad. However, Yakov was attacked over a dozen times and never fell allowing Red Yana’s squad the opportunity to keep their numbers up to deliver all the damage they did.